ABSTRACT: I’m interested in understanding what drives success in physical activities, and I study performance in very different but complementary systems: wild marsupials and professional athletes. The study of humans and wildlife have operated in relative isolation; by bringing these disparate fields together I aim to change the way we study performance — ultimately providing new insights into conservation, evolution and sport development. In this seminar, I will present data on wild northern quolls, semi- and professional soccer players, and professional tennis players to demonstrate the three factors I believe are fundamental to this new performance paradigm: (1) studying suites of traits, (2) measuring athleticism and skill, and (3) focusing on performance outcomes. 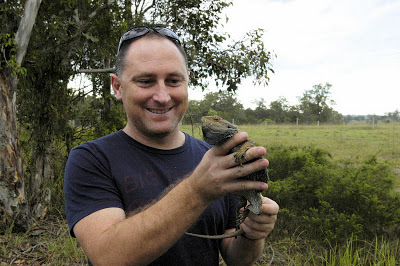 BIO: Robbie Wilson is an Associate Professor and ARC Future Fellow in the School of Biological Sciences at the University of Queensland, where he has been a faculty member since 2006. Robbie completed his PhD in thermal biology at UQ in 2000 and his undergraduate studies at the University of Sydney in 1993. After completing postdoctoral positions at the University of Antwerp in Belgium and the University of St Andrews in Scotland, Robbie returned to UQ to take up an ARC early career fellowship in 2003. His research interests are in the ecology of physical performance, with a focus on understanding what drives task success in wild animals and human athletes. Appointments with guest speaker may be made via Beata Ujvari.